If you see a black car with the Google logo in Ireland in the next few months, give a wave. 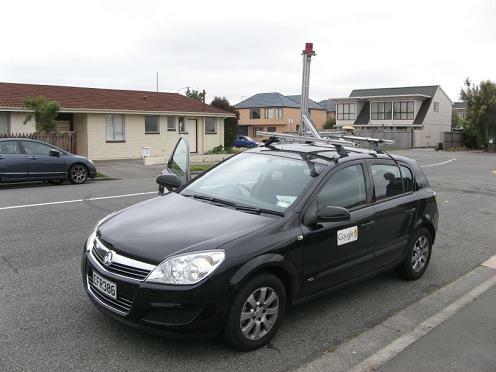 This is the Google car used to capture images for Google Maps’ Street View. Street View is Google’s online, interactive, panoramic street level photographic mapping system that is part of Google Maps. The street car is now in Ireland taking images of Irish streets in five cities: Dublin, Cork, Limerick , Galway and Waterford. Google hope to have these cities on Street View within the next few months. Street View has received a lot of media attention recently in the UK due to concerns over privacy. According to Google, their technology blurs out both faces and registration plates and people can also report details on Street View that are inappropriate. So how useful is Google Maps’ Street View? Tourists can use it to check a city they intend visiting, auctioneers could use it to sell houses and businesses are already using Google Maps on their websites to show their location. We use Google Maps on our school website. See what cities and towns are currently available in Street View. The US Defense Department has banned Google from filming and depicting in detail its military bases, after officials found precise imagery of a Texas base on the Google Maps website.